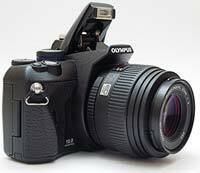 The Olympus E-450 is a new compact DSLR camera. Offering 10 megapixels and a 2.7 inch LCD screen, the diminutive E450 is one of the smallest and lightest digital SLR cameras on the market, weighing less than 400g and easily fitting into a small shoulder bag. Successor to the E-420, the Olympus E450 additionally offers 3 in-camera Art Filter effects - Pop Art, Pinhole and Soft Focus - and an improved Live View mode. Other key features of the Olympus E-450 include a 2.7-inch LCD screen, contrast detection autofocus and and face detection in Live View mode, continuous shooting speed of 3.5 fps, wireless flash control for studio shooting, Shadow Adjustment Technology, Supersonic Wave Filter for dust reduction, ISO 100 to 1600 and dual memory card slots for xD-Picture Card and CompactFlash, and Perfect Shot Preview for previewing camera adjustments before you take the photo. With a retail price of around £350 body only or £450 for the single lens kit in the UK, and $699 for the double lens kit in the US, we find out if the new Olympus E-450 is the best small DSLR around. These days, it is rare to see an SLR with (practically) no right-hand grip – but those who used to shoot all-manual SLRs will remember that grip-less cameras were the order of the day right up until the early 1980s. With all the retro craze going on in the past few years, it was not all that surprising to see a manufacturer come out with a DSLR that paid homage to the now-legendary manual cameras of the 1970s and 1980s, at least in terms of its outer appearance. This was the Olympus E-400 of 2006, whose direct descendants, including the E-410 and the E-420, shared the same essentially grip-less design, and the latest incarnation, the Olympus E-450, is no exception either. Photographers who have never used a manual SLR – or one of the earlier Olympus E-4x0 DSLRs – will initially have a hard time figuring out how to hold the E-450 securely and comfortably, but the recipe is as simple as it was 30 years ago: hold the camera's weight in the left hand, clutching the lens, and use your right hand for balance and operating the controls. Having said that, it needs to be mentioned that people with long-ish fingers will still find the compact E-450 a little awkward to use – but those with small hands will likely love the ergonomics. Just like its predecessors, the E-450 is better constructed than you'd expect given the diminutive size, light weight and low price. Thanks to the glass-fibre reinforced plastics used, the camera feels rather solid, perhaps more so than some of its entry-level competitors. The controls are clearly labelled, although the buttons lack the funky back-lighting you'll find on the more expensive E-620. The neck strap eyelets are still at the front rather than the sides, no doubt because this position is better to prevent the lightweight camera from becoming front-heavy with a lens attached – but it can be a little inconvenient for the photographer. Weighing in at just over 425 grams including a battery, the Olympus E-450 is the lightest DSLR on the market, along with the E-420. One of the reasons is the use of the BLS-1 battery, which is considerably smaller and lighter than the BLM-1 that powers the E-520, the E-30 and the E-3, as well as a number of older models. When it comes to storing your photographs the Olympus E-450 allows you to use Compact Flash or xD-Picture cards, but although it's possible to have one of both inserted at the same time, you cannot simultaneously record an image on both, as only one of them can be selected at any given time as the active medium. You can, however, copy already recorded images from one card to the other, which is great if you want to make backups in the field. The Olympus E-450 sports a traditional eye-level optical TTL finder, which is fairly bright and eminently free of any distortions or aberrations, but rather small. It's fine for framing but not so great for manual focusing, which is better done in Live View. The in-finder status LCD runs vertically along the right-hand side, just like in the E-420, but unlike in the E-620, the E-30 or the E-3, where it is in a more traditional place at the bottom. The 2.7", 230,000-dot rear LCD screen has a very wide viewing angle and remains visible outdoors in the sunshine too, but only if you crank up its brightness to the maximum. Do note that the camera may be shipped with a transparent LCD protector, which can be seen in some of our product shots too, but you will want to remove it for optimal outdoors visibility. The colour temperature of the screen can be modified if you think it doesn't match that of your calibrated computer monitor. On the other hand, the contrast and gamma of the screen cannot be altered. As the E-450 lacks a separate monochrome LCD, the rear screen doubles as a status display, which can be called up by pressing the INFO button in record mode. Moreover if you press OK instead of INFO, you can also change all important settings right on the screen, which Olympus calls the Super Control Panel. This ingenious solution spares you the pain of having to enter the menu, and makes most settings changes fairly simple. That said, I regret that Olympus decided not to map any of the oft-used functions that do not have their own dedicated button – such as ISO sensitivity, focusing mode, metering or white balance – onto the four-way pad, like they did on the E-520 and E-620 models. This would have made the E-450 easier to use. Alternatively, they could have made the arrow buttons customisable – but they decided to do that with the Left button only. Well, at least exposure compensation, flash and drive mode selection have their own buttons, all situated on the top plate. One of the most important functions of the LCD is providing on-demand Live View in record mode. 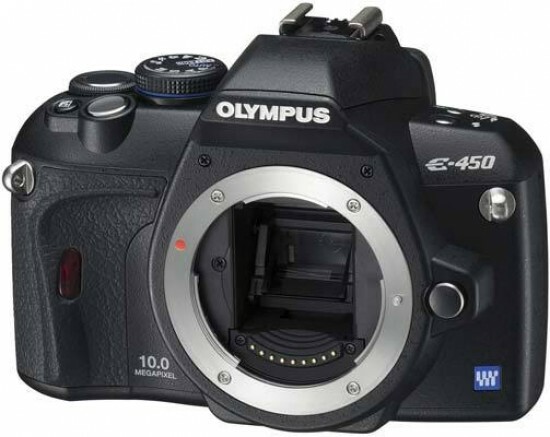 As with all recent Olympus DSLRs, Live View on the E-450 is of the main-sensor variety and as such, serves primarily as a framing and manual focusing aid. While the E-450 lacks the articulated screen of the E-3, E-30 and E-620 models, it can still be used to conveniently frame your photos when shooting from the hip or from above your head, owing to the wide viewing angle of the LCD, and manual focusing is greatly enhanced by the 'enlarged display' function. Once you have selected manual focus mode and entered Live View via its dedicated button, press INFO repeatedly until a green rectangle appears in the middle of the display. You can move this rectangle around using the four-way pad, and magnify into it by pressing OK. The default magnification is 7x, but you can raise this to 10x by turning the control wheel. This is real, non-interpolated magnification, very useful for accurate manual focusing – provided you find a way to steady the camera. A second press of the OK button will let you see the full frame again. This is not the only screen available in Live View. You can specify how much shooting information you want to be overlaid, can call up a live histogram or a shooting grid (though sadly, not both at the same time), and can view what effect the different WB settings or different amounts of exposure compensation would have on the final image, in a multi-frame window. The Super Control Panel can be called up by pressing OK while any of these screens is displayed, except when the green rectangle is shown or when you are in enlarged view, as indicated above. When available, the Super Control Panel appears as a semi-transparent overlay, but can otherwise be used as usual. For low-light or infrared shooting, you can enable a feature called Live View Boost from the menu, but in this case, the live histogram may not function properly and the effect of exposure compensation adjustments will not be reflected on the monitor. As noted above, Live View is primarily a framing and manual focusing aid, but this is not to say you can't use auto focus. In fact there are three different AF methods available in Live View, including Imager AF, Hybrid AF and AF Sensor. Imager AF, more widely known as contrast-detect AF, works with a handful of lenses only, including the Zuiko Digital ED 9-18mm f4-5.6, ED 14-42mm f3.5-5.6, ED 40-150mm f4-5.6, ED 70-300mm f4-5.6, the 25mm f2.8 “pancake” lens and the 14-54mm f2.8-3.5 II. With these lenses, Imager AF can also be used in conjunction with Face Detection. In Hybrid AF mode approximate focus is achieved via the same contrast-detection method, but the 'real' AF sensors still get engaged when you fully depress the shutter for taking the shot. With a FourThirds lens other than those mentioned above mounted, the camera defaults to this mode in Live View even if Imager AF is selected. Finally the oldest method, AF Sensor, is also available, and might prove the fastest option with lenses that are not optimised for contrast detection. The E-450 offers a comprehensive set of exposure modes, including P, A, S and M for advanced users, a full auto mode for novices, plus a legion of scene modes and three Art Filters: Pinhole, Soft Focus and Pop Art. It is the presence of these filters that most obviously differentiates the E-450 from the E-420. These Art Filters are 'canned' special effects that spare you from having to spend a lot of time in post-processing just to achieve a certain look. While they are fun I think they would be more useful if you could alter their parameters within certain limits and also if you could download new ones from the manufacturer's website. Neither is the case at present, though this might change with a future firmware update. Do note that using the Art Filters slows the camera down a little. 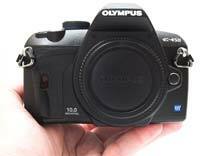 The Olympus E-450 has a number of features that you would not expect to see in an entry-level model. Among these are Pixel Mapping, user-configurable mirror lock-up (called Anti-Shock by Olympus) and spot metering, which comes in no less than three variations: midtone-based, shadow-based and highlight-based. The latter two make life easier for those who know what spot metering is but do not know how to use it in combination with exposure compensation. These options come on top of the usual centre-weighted and evaluative modes. The AEL button can be separately configured, so even if you have, for example, centre-weighted set as your working mode, the AEL button can be designated to use e.g. highlight-based spot metering. In summary, the E-450 is a compact, lightweight and feature-laden DSLR, which could nonetheless be improved by the addition of a bigger finder, more autofocus points and direct access to AF mode, white balance, metering mode and ISO sensitivity via the four-way pad. If you think these are things you need, you'll likely be happier with the E-620, which has them all, plus image stabilisation and a free-angle LCD, in a body that is only marginally bigger and heavier. If you are on a tight budget though, the E-450 is the better choice.